Invented in 1873 by the chemist Sir William Crookes as the by-product of some chemical research, the radiometer is made from a glass bulb from which much of the air has been removed to form a partial vacuum. Inside the bulb, on a low friction spindle, is a rotor with several (usually four) vertical lightweight metal vanes spaced equally around the axis. The vanes are polished or white on one side and black on the other. When exposed to sunlight, artificial light, or infrared radiation (even the heat of a hand nearby can be enough), the vanes turn with no apparent motive power, the dark sides retreating from the radiation source and the light sides advancing. You are getting 3 such radiometer spheres that are about 3.4 inch, 3.15 inch and 2.36 inch diameter each and a glass drop. Just hang near a window as the vanes only rotates in light (sunlight or incandescent light). The more light shine on the globes the faster the vanes rotates. 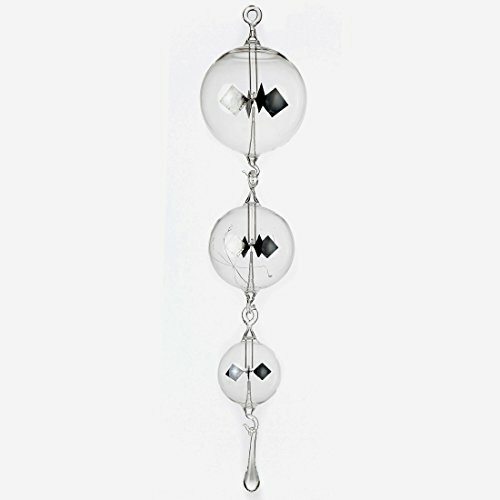 Magnificent chain of 3 Radiometers; Large, Medium, Small with drop at the bottom. All made of glass. Large at 3.4 inch dia., Medium at 3.15 inch dia., and Small at 2.36 inch dia.